Today is an historic today. 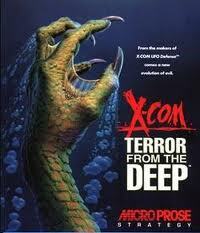 I finally beat X-COM: Terror from the Deep. I started playing TFTD in 1996, and played it for a couple of years without succeeding. The reason for this sad state of affairs is a combination of software bugs and a refusal to look up the winning strategies. Years went by. One important development in that time was that I adopted a baby boy, Noah. Recently, I discovered that the game was back on Steam, and he and I would sometimes sit together on Sunday mornings and play. Since getting it running on Steam I’ve been trying for about 6 months. Yes, I know, I’m pathetic. Anyhow, finally, a 17 year obsession comes to an end. Today the aliens were kicked off of Earth. For good. You can all sleep safe in your beds, knowing the oceans are alien free.